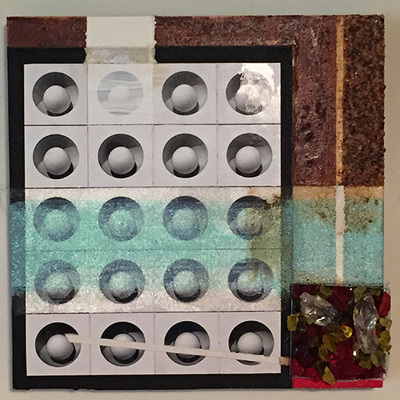 Three mixed media pieces done in collaboration with fine art photographer, Carl Shubs for the Los Angeles Art Association (LAAA) Collaborative Exhibit, VS. May 21 - June 3, 2016 at Gallery 825, Los Angeles, CA. 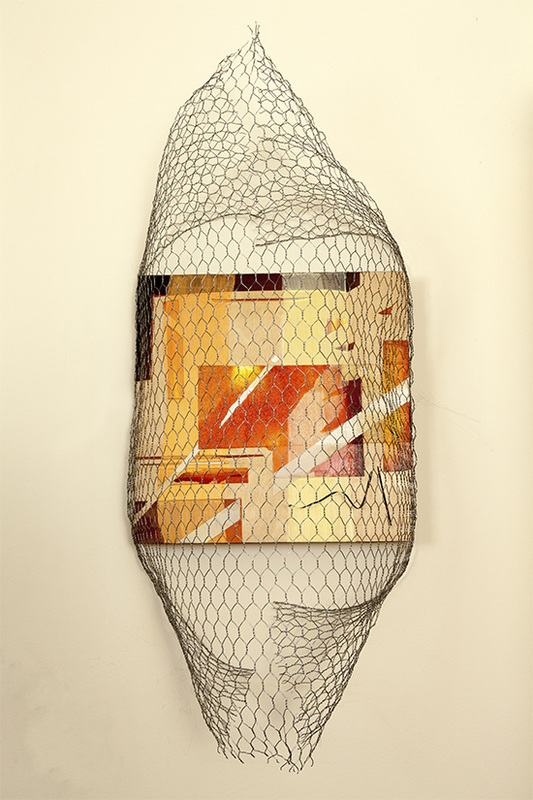 ​Caged Room and Behind the Curtain were juried in to the show by Curitor. This collaboration began as a project through the Los Angeles Art Association. We were randomly selected from the standpoint of art practice and artist. I am an abstract painter using primarily acrylics and Carl is a fine art photographer. I decided to continue with materials and approaches I currently use, including iridescent glazes, glass bead gel, taped edges against free-flowing edges allowing the materials to surface. I like French clear gesso as it allows the maple grains of the panel board to show through and become part of the work. 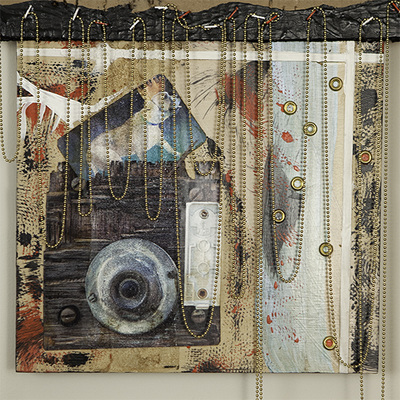 With "Behind the Curtain", after the prep work with the gesso on the maple panel board, Carl collaged-in the beautiful weathered wood and old hardware with a crowned dog perched above as his photographic contribution. I was immediately struck with an association of the West, particularly the amazing old barns dotting the landscape in Wyoming that are part of the state's treasure. The mood and emotional content harkens back to our romantic notions about the West. I had recently reacquainted myself with the Rockies in winter, and was struck by the aqua pools of the melting snow and ice; thus,the shimmering glazes and glass bead gel adding some winter mood and a reference to the sparkling morning frost over barn wood and western sage. It is like a sweet morning scent and color like no other usually gone by the afternoon sun. I like leaving some hint of the original panel board as the grain is a juxtaposition to our mechanized, digital world. Because of the sun, one blinks their eyes and both the color and scent have evaporated into the southwest atmosphere; so the glaze remains transparent recreating that luminous atmospheric quality. Carl took "Behind the Curtain" further with fantastical cardboard proscenium, staples, and beads. For me the work became instantly reminiscent of the old caravans of the Wild West like Wild Bill and Annie Oakley-those traveling shows we rarely see anymore. The cardboard becomes the proscenium seen in the carnivals or the great old theatre of New York and London; the beads; the opulent red velvet curtains. Is The crowned dog, King of the carnival show, or just a reference to the cow-dogs seen roaming about, or our own beloved pet? Technically, all becomes a mystifying reference to theater architecture from the ancient Greeks, to a shabby caravan show with of course, a star, the dog.